Williamson Rock, Angeles National Forest will always be a special place to me. It’s where I did my first sport lead, and home to many fond memories of enjoying the wilderness, fresh air, and the company of friends. It’s also been closed since 2005, due to concerns over habitat for the the mountain yellow legged frog. Every year climbers have tried to come to an agreement for use of this area, but none has been reached. This year, U.S. Forest Service Landscape Architect Jose Henriquez holds out a glimmer of hope. The Forest Service has fashioned together a proposal that will manage the frog habitat with new trails and amenities while re-opening the rock to climbers, albeit for only four months a year. The article also mentioned that the comment deadline is January 24th, just 3 days away! Here’s a link to take action, using an easy etter writing tool from Access Fund. I urge you to make your voice heard, Williamson is a fantastic area that I strongly believe climbers can enjoy and also respect. It is a granite gem in Los Angeles county. We need your help to lift an eight year climbing ban at Williamson Rock. 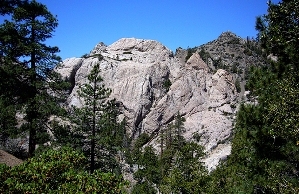 Williamson Rock, the premier sport climbing destination in Southern California, has been under an eight-year “temporary” closure to allow the US Forest Service to analyze whether to allow climbing access while also protecting raptors and the endangered Mountain Yellow Legged Frog and its critical habitat. The Angeles National Forest is once again evaluating the closure and, in an initial scoping letter, has proposed several actions to re-open climbing access to Williamson Rock. The proposed actions include: permanent and/or seasonal closures of some portions of the Williamson Rock area, construction of new access trails with educational signage, construction of a bridge and trailhead restrooms, rehabilitation of select user-created trails, and development of a monitoring and adaptive management plan. Allied Climbers of San Diego, Friends of Williamson Rock, and the Access Fund need your help to provide the Forest Service with climber input on this letter! Please take action now by using our easy-to-use letter writing tool to submit comments to the Forest Service and ask them to re-open Williamson Rock.